I have to start by saying that this is my absolute favorite fountain pen ink PERIOD. I have really gotten into blue-greens since I decided I’d only use fountain pens (to the extent to which that is possible). 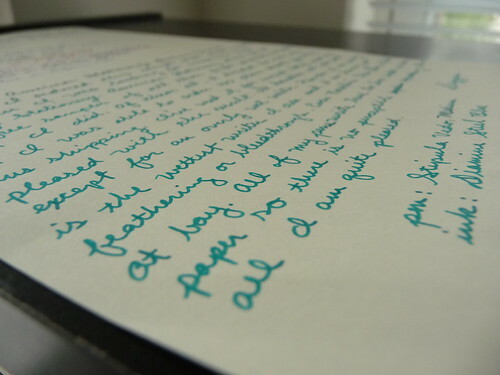 My favorite color is actually purple but for some reason I just can’t get enough of writing in blue-greens. Pretty soon I’m going to do a blue-green show down. So far I have Dia Steel Blue and samples of CdA Caribbean Seas and Iroshijuku Ku-Jaku. All I need is a sample of PR Blue Suede and I’m in business. 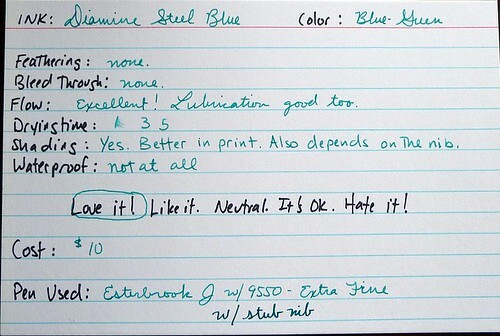 Diamine Steel Blue is very well behaved in all respects. I have not experienced feathering or bleed through with this ink. The flow is EXCELLENT! I mean it is perfect in almost every way. It’s not too wet or too dry. The lubrication is pretty good too. You definitely won’t have any problems with "dry nib" using this ink. The drying time is pretty quick for an ink this saturated. Drying time averages about 5 seconds across all my papers. Shading is pretty good, but this ink really shines on high quality slightly glossy papers like Clairefontaine and Rhodia. Do not expect shading on par with the Caran d’Ache or Herbin inks, but it is certainly present and beautiful. Now the only down side, if you can indeed call it that, is that this ink is not waterproof at all. It’s hardly even water resistant. If you spill something on this ink you will like lose most if not all of the writing. This is repost of an image I used in my Business Monarch review. It shows this ink off quite nicely. The pen used for this was a Stipula Vedo with medium nib.